Hydrogen powered trains coming out to be best. Have you ever heard of hydrogen powered trains before? They are just few steps away from traditional diesel power. 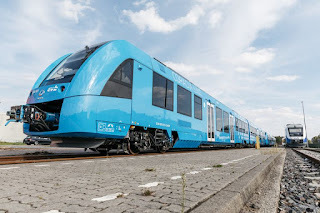 These trains are equipped with fuel cells which convert hydrogen and oxygen into electricity, thus eliminating pollutant emissions related to propulsion.The trains, which promise a low-noise trip, can hit speeds up to 140 km/hr, or 86.9 MPH. They'll run on 100 kilometers (62 miles) of track. Buying hydrogen train is really expensive than diesel trains but it's easier to run. The world's two first hydrogen-powered trains have begun service in Germany. Running on a single tank of hydrogen, they can run around 600 miles (1,000km), on par with a diesel train. Air pollution has become an increasing problem in Germany, with nitrous dioxide causing over 10,000 premature deaths in 2016.